LastActivityView Download link not working. I found the way to remove these findings: First delete windows Prefetch entries "C:\Windows\Prefetch" this will delete all the .exe files in LastActivityView. Next Run RegSeeker2.5.7 and select privacy Key on the left side of the menu, and at the bottom select "Clean stream MRU/streams Keys". That's all there is to it. I like this tool as it shows "All" activity that has taken place on ones computer. 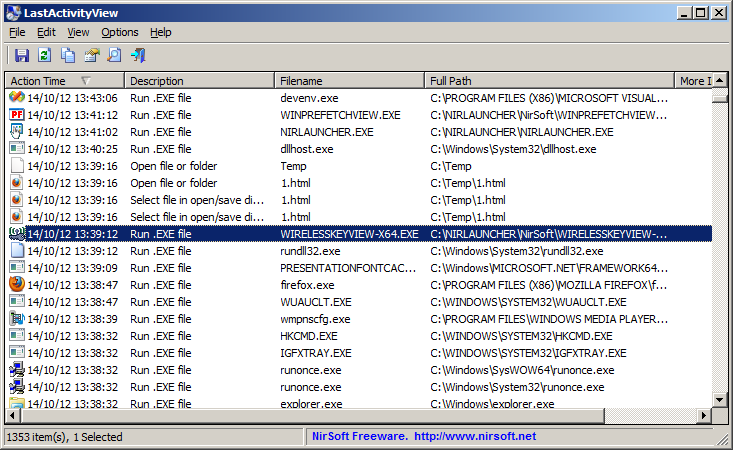 It will show every folder that has been opened, every .exe file that was used, every encryption tool that has been used. Kind of scary? I have yet to find a way to delete these items from a windows 7 system. Ccleaner and almost every other privacy tool have been tried. I have even read the topics from NirSoft about this. Anyone here know of a solution to clearthe Activity view? Neat application. Its worth noting that the 'Run .EXE file' items won't show up if you've disabled prefetch on your O/S, which is a common optimization for SSD drives.